RedBus – One of the most popular Online Bus Ticketing & Domestic Hotels Booking Platform. 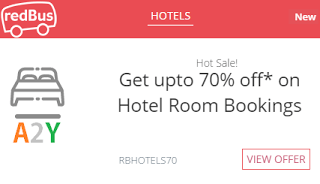 Book Domestic Hotels through RedBus & get Upto 70% off on Hotel Room Bookings (Upto a max. of Rs. 1,000). Enter Destination & Journey Date & Traveler details. Browse through the hotels present, Go through the rating & Select the best one. Enter your Name, Email & Other required details. Proceed to Pay & Pay the required amount online. Use offer code RBGOSTAYS70 Bookings done using promotional code RBGOSTAYS70 will be non-refundable. Offer is not applicable to bookings made by travel agents.